trunkmaster Archives - HexByte Inc.
NEXTSPACE is desktop environment that brings NeXTSTEP look and feel to Linux. I try to keep the user experience as close as possible to the original NeXT’s OS. 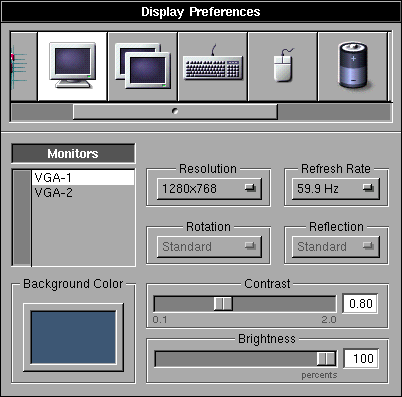 It is developed according to “OpenStep User Interface Guidelines”. If you’ve noticed or ever bothered with naming convention all of these “NeXTSTEP, NextStep”, here is explanation. Hexbyte Hacker News Computers What NEXTSPACE is? Simple login panel where you enter your user name and password. File Viewer – file system navigation, create, copy, move, link files/directories. Window manager – app icons for X11 application, move, resize windows, workspaces, dock, starts applications after logon. Process – shows information about X11 and GNUstep applications, background processes of file manager. Media – automatically mounts removable media, has menu item to eject/unmount removables. Other: inspectors, finder, console messages and preferences for mentioned the parts of Workspace. Settings for locale, fonts, displays (size, arrangment), keyboard, mouse, sound, network, power management. It is designed to manage settings related to: GNUstep (NSGlobalDomain), WindowMaker (~/Library/Prefrences/.NextSpace/WindowMaker), Xorg (keyboard, mouse, displays), CentOS Linux (sound, networking, power). Preferences and Services panels are rewritten from scratch. Numerous fixes and enhancements in: color management (background, foreground can be any and can be configured in preferences, bold, blink, inverse, cursor colours), cursor placement fixes on scrolling and window resizing, ‘Clear Buffer’ and ‘Set Title’ menu items. Now you can search through the text displayed in Terminal window (Find panel). Session management: you can save window with all settings that are set in preferences panel (including shell/command) to a file and then open it. Configuration with multiple windows is supported. Simple text editor that supports RTF and RTFD. It is simple application from NeXT Developer demos. Image viewer. Nothing interesting yet. Maybe replaced by some other image and document (PDF, PostScript, etc.) viewing application in future. TimeMon: system load monitoring. Version from GNustep Application Project. Weather: Shows weather conditions from Yahoo! weather site. Proof of concept (no preferences, no forecast, shows weather for Kyiv, Ukraine). NXAppKit: GUI classess that can be usefull in multiple applications (for example: ClockView, ProgressBar and ProgressPie). NXSystem: system-specific classes go here (UDisks, UPower, D-BUS, XRandR, XKB, etc.). ‘NX’ prefix is a tribute to the NeXTstep classes back in early 90th but has no connection to original NeXT’s API. CentOS Linux 7 and its technologies (systemd, UDisks2, Xorg, etc. ): stable, well supported enterprise level OS. Objective-C runtime: libobjc2 by David Chisnall. 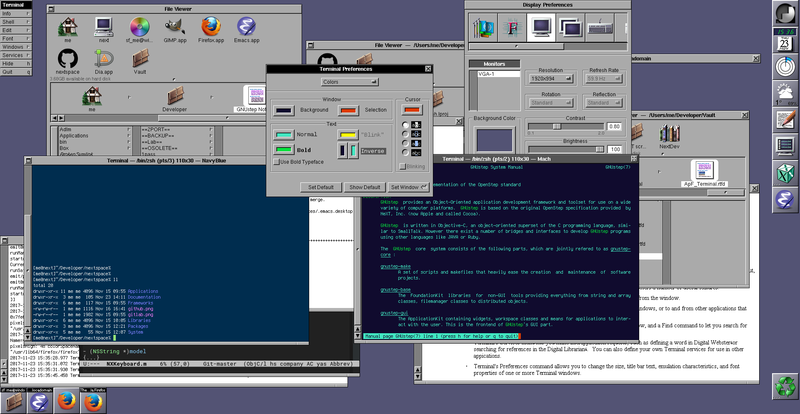 OpenStep implementation: GNUstep. This is where I started from back in 2001. Additional functionality and fixes will go upstream when it will be ready. WindowMaker: great window manager. It is still alive and in active development. All changes I’m packaging as a set of patches (to the original 0.95.7 version) which can be pushed to upstream project later. Hexbyte Hacker News Computers Why am I doing this? I like look, feel and design principles of NeXTSTEP. 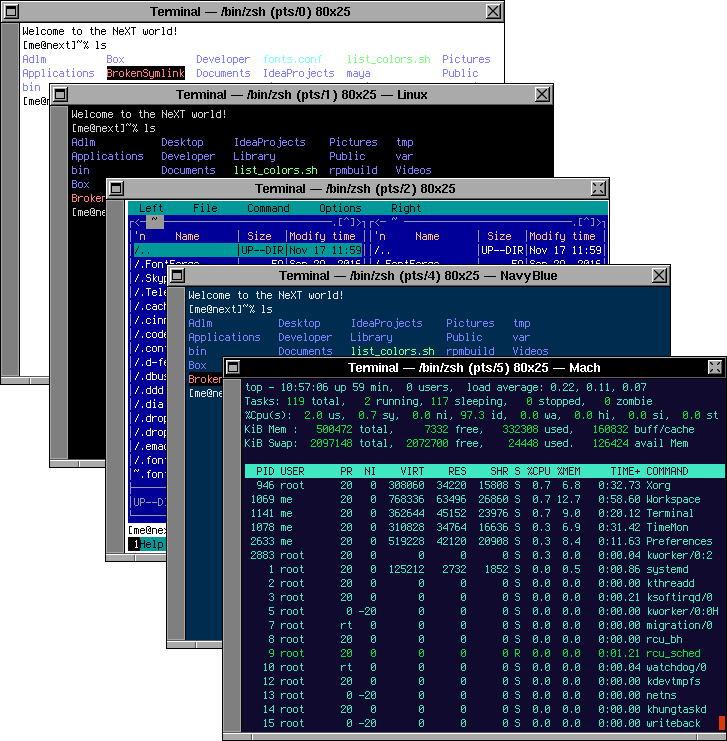 I think GNUstep needs reference implementation of user oriented desktop environment. As main developer of ProjectCenter (IDE for GNUstep) I need desktop environment where ProjectCenter can be developed, tested and integrated with. Maybe some day it will become interesting environment for developers and comfortable (fast, easy to use, feature-rich) for users. Porting to other Linux distributions and operating systems for now. I want fast, accurate and stable version for CentOS 7 at last. However, NEXTSPACE was designed to be portable and this point maybe changed in future. WindowMaker only fork (Workspace includes WindowMaker though). GNOME, KDE, MacOS rival in terms of visual effects, modern design principles, look and feel. Implement MacOS X like desktop paradigm. There is another good place for this — Étoilé.